The striking Trinity is the boldest urn in our affordable Endless Love line. 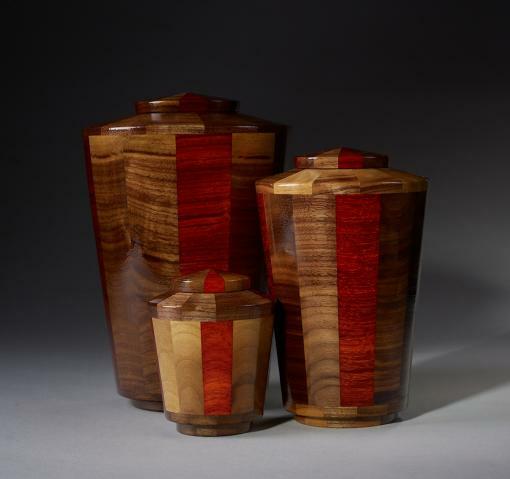 Made from Black Walnut and Padauk woods, the hand-turned Trinity urn features an elegant mix of earthy brown and vibrant red shades. 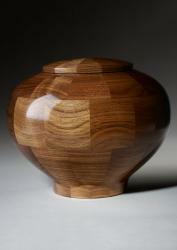 Like the other urns in the Endless Love line, the Trinity is available in keepsake, small, and large sizes. Depending on the size, the Trinity can be used to memorialize cherished pets, children, or adults. Urn jewelry is available separately at Etsy Charmed Wife Shop. 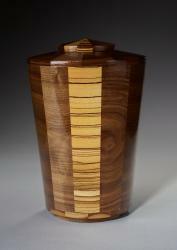 This is actually my 2nd urn from the collection but my 1st of this design. The craftsmanship is excellent and the urn itself is beautiful! My only comment is I prefer the top loading urns, this one had the screw bottom cardboard. Overall these are the best and most beautiful urns worthy of my babies' ashes. Most beautiful urn I have ever seen. It is very well made and easily used. I have gotten many compliments on it, and I will definitely share the word of Steve Shannon Collection. This is probably the most common sized urn, designed to hold the cremation remains of one individual. The average amount of cremation remains for an individual is usually a little less than 200 cubic inches, so our large size urns work well in the vast majority of cases. This size is commonly used for a child or a medium/large pet. These urns range in size from 75-94 cubic inches. 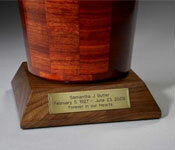 These urns are the smallest that are available from the memorial industry. Ours range in size from 13 to 22 cubic inches. 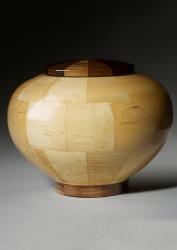 The most common use of a keepsake urn is to hold simply a small portion of cremation remains. Keepsake urns are most often used by families who want to share a loved one�s remains. A small portion of the remains are often poured into two or more keepsake urns, and those urns can be divided among families who live in various regions. They are also used for small pets.